Welcome to Alumni Spotlight, a blog series focused on our alums – where they’ve been and where they are now. 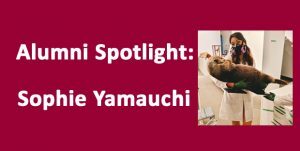 For this installment we interviewed Sophie Yamauchi. My experience at Cardiff University was a little bit different than most. In 2016, I arrived as a 3rd year undergraduate exchange student from the University of British Columbia (UBC) in Canada. As bewildering as it is, exchange students do not know what they are studying until they arrive in Cardiff and meet with an advisor. As an exchange student, lost and confused about modules but interested in museums, I was, somewhat randomly, persuaded by Jane and Phil to enroll in 1st and 2nd year BSc Conservation modules along-side 1st year BSc and MSc students. Therefore, while I was completely immersed in the program for one year, I did not formally complete a degree at Cardiff. After my crash-course in conservation and museums in Cardiff, I returned to Canada to finish my BA in Anthropology with a focus in museum studies from UBC. I intend to enroll in an MA in Museum Studies next year. Since leaving Cardiff a little over a year ago, I have continued my education in the heritage sector through classes and internships in Vancouver, Canada. As someone interested in museums as holistic institutions, I have sought experience in curation, education, collections management, and conservation. While I love it all… this is what I have been up to in conservation! During the school year, I interned in the conservation department at the UBC Museum of Anthropology. Known for their ethical, community-centred approach to the conservation of ethnographic materials (specifically those of Indigenous Northwest Coast communities), I was privileged to learn about the entanglement of intangible cultural preservation with traditional, scientific conservation. There, I worked on basketry, feather work, and ceramics; assisted with Oddy testing and other analyses; and helped with seismic upgrades in the museum’s storage. As part of an academic research project-gone-rogue, I also worked with the Museum of Anthropology to conduct research about the state of emergency preparedness in the heritage sector of British Columbia. As a large province, home to many small museums without specialized conservators or disaster plans, the B.C. heritage community is in need of a formal heritage response network to help in the case of a collection emergency. Teaming up with our provincial museum association and local conservators, I have been looking into examples of networks that already exist around the world. 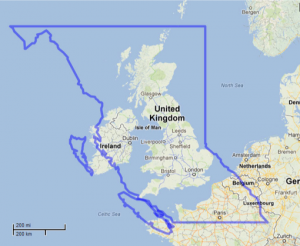 I am still researching how to best create this (low-cost) network in the case of a flood, fire, earthquake, or other disaster, and would love to hear from readers if you have any suggestions. 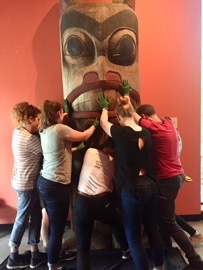 This summer, I have been working at the Museum of Vancouver as a conservation technician. 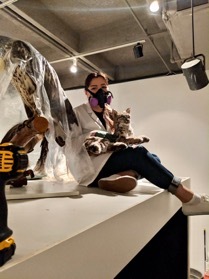 I was hired to assist with the conservation of a taxidermy-heavy exhibition, as well as the maintenance of the municipal museum’s 60,000 object collection. 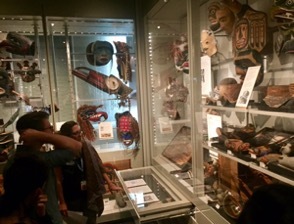 Some of my work has included cleaning and mounting taxidermy, creating wood and foam mounts for Indigenous basketry, and re-arranging (some very large) objects in the museum’s storage. My career is just getting started, but I am incredibly thankful to have amounted as much experience as I have already. 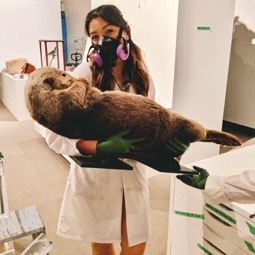 One of my favourite projects in conservation, so far, has been preparing a taxidermy exhibit for display at the Museum of Vancouver. Many of the animals were in poor condition and needed specialized mounts to keep them safe. For this, I traded in the scalpel for the band-saw, and the B72 for the power drill, and learned how to do woodworking and craftsmanship. Stepping outside my comfort zone, I really enjoyed this experience! 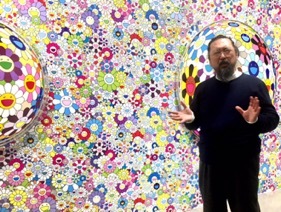 Outside of conservation, I also interned at the Vancouver Art Gallery, where I helped with school and teen programming for an exhibit by Japanese artist, Takashi Murakami. Working with some of the best educational programmers in the country and Murakami himself, I got to experience working with a famous contemporary artist and help translate his renowned work into digestible material for children and teens. It was an envy-able highlight! I have always loved museums, but coming to Cardiff to study-abroad, and randomly enrolling in CU Conservation, sparked a love for the museum world that has fueled a deep passion to devote my life to them. I am thankful everyday for speaking to Jane and Phil and having them persuade me to sign up for their modules – they truly sent me down a new path that day and I cannot imagine a different future. While I do not formally hold a degree from Cardiff University, as an honorary alumnus, I get the benefits of gloating that I attended (the greatest) conservation program in the world, in addition to all the practical skills I attained and use to this day. Although I currently do not plan on becoming a real conservator (wow there are really no jobs over here), I plan on applying my knowledge in conservation to other aspects of museum management… everything is connected! I adored the intimacy and intensity that the program offered. In my year, most students were foreigners, and the program’s small size allowed us to connect with each other and discover Wales together. I wouldn’t change a single thing! If there is anything else you’d like to mention now is your chance. Plug you book or podcast! 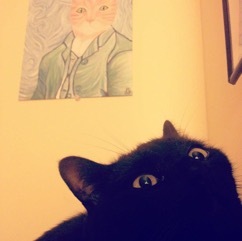 Share a picture of your cat! Share your most recent conference selfie! While school is indisputably important and required, I maintain that work experience is key to fuelling a career in the heritage sector. Any chance you have to volunteer in a museum, heritage site, or conference… take it! Expand your networks as much as you can, edit your LinkedIn, be active on Twitter, and publish anything you can (even on non-academic sites). Making yourself visible will not only aid in your own career, but help the international museum community stay connected. Any incoming exchange students, BSc, or MSc students feel free to reach out to me on Twitter as well! Thanks again to Sophie for sharing her experiences with us. Make sure you go give her a follow on her social media and be on the look out for updates on her current endeavors!